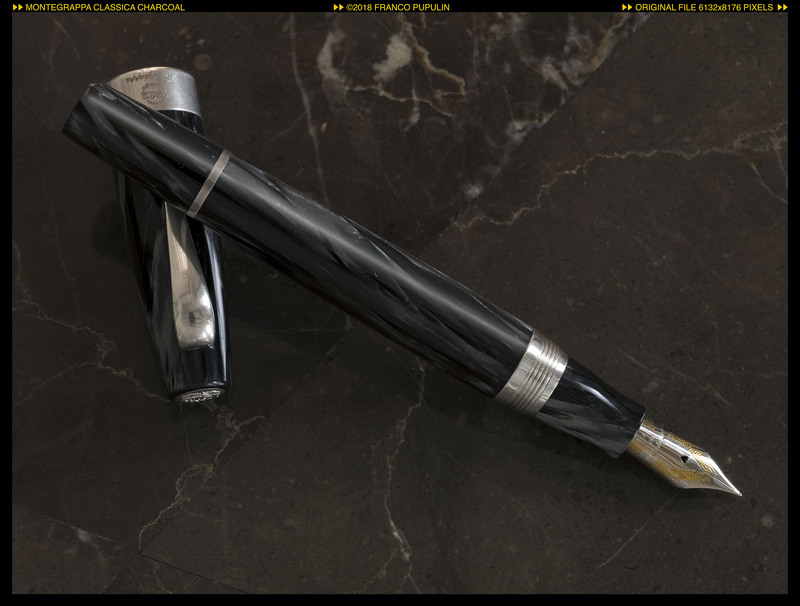 At the beginning of this year, I was fortunate to find a Montegrappa classic fountain pen, in the beautiful charcoal celluloid, at a price so good that I could not pass it. 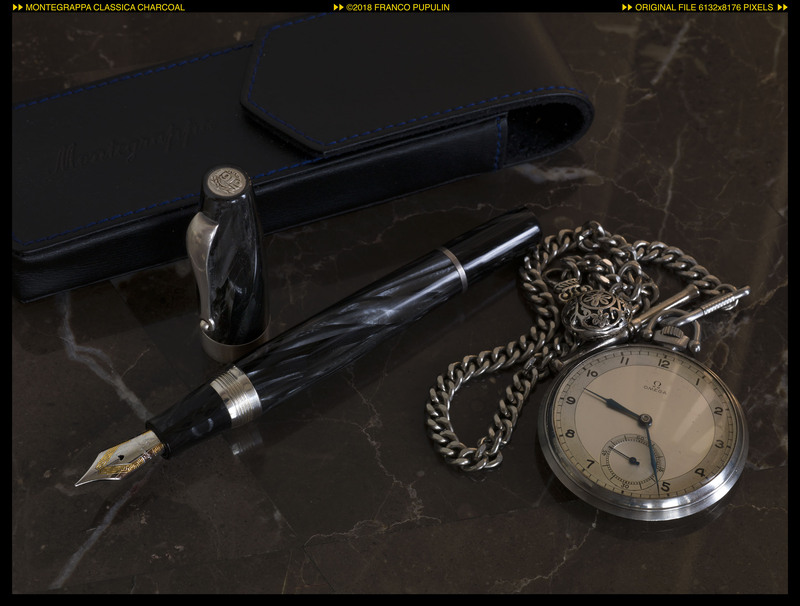 I have always been intrigued by the Classica, as the founder parent of an entire lineage in the Montegrappa production, which includes some of the pens that I most appreciate from the maison of Bassano del Grappa. I will discuss this more in detail in the last part of this thread, but meanwhile let me present you my Classica and a work I made with her. The three color versions of the original Classica are in my opinion true classics of Montegrappa and, more in general, true classics in contemporary fountain pens. The turquoise is probably one of the more vivid celluloid ever produced, at a point that its deep shadows seem enlighten from inside the pen body. 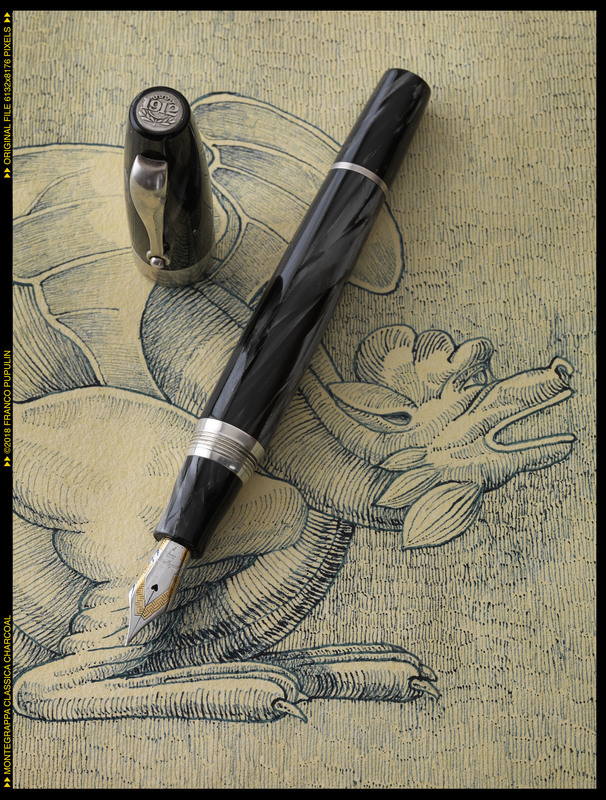 The elusive cinnamon, often confused with the red celluloid presented for the first time with the Historia, is a rarely seen color and likely the most unique of Montegrappa early contemporary celluloids. Finally, the charcoal, mostly dark grey, with the deep nuances only appearing plenty under certain angles, is a understated, sober, and professional model. Illuminated "correctly", the depth of the celluloid tones is comparable to that of the Omas pearl-gray celluloid of the Seventies. 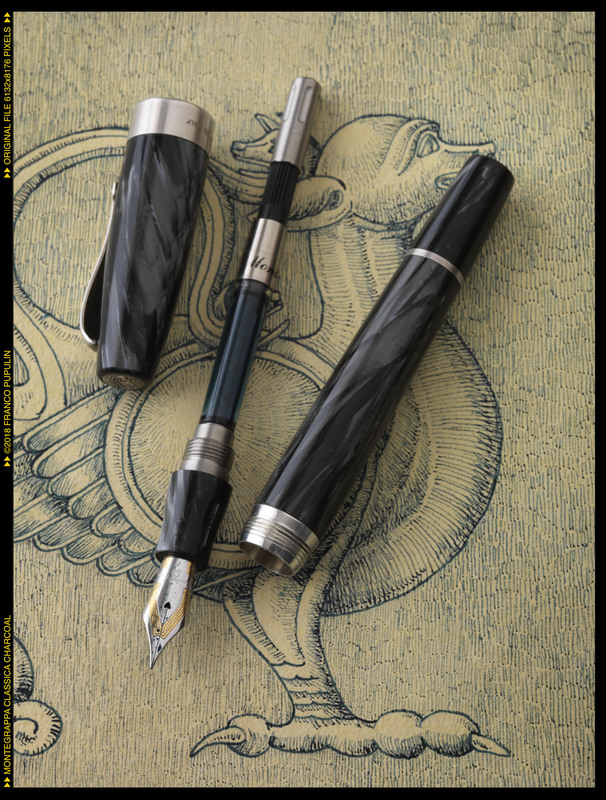 The charcoal color is my favorite of the three of the Classica line for a general use. The cap ring of the Classica, which is mechanically engraved (ti will laser engraved in successive models), does not bear any fret, just the logo and te name of Montegrappa, and the silver guilds. The now famous Montegrappa greek fret will be only inaugurated with the Historia and it was again improved and made perfect the following year on the Extra. 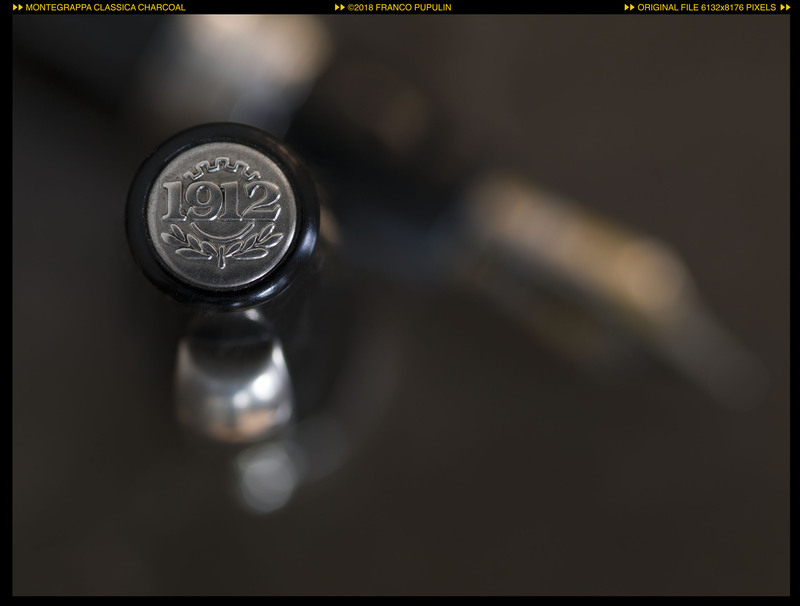 Classica can be loaded using cartridges or a dedicated converter, accessible in the usual way, by unscrewing the section from the body, or by unscrewing the blind cap to reveal the end of the converter and operate its piston from this position. It is a mechanism of no great use, since it does not allow to visualize the charge level of the converter, but it is a curious exercise. By making the blind cap integral with the threaded end of the converter you get what it is called a captive converter, actually used by Montegrappa in its Extra and perhaps also in the Extra Otto. In my Classica specimen, the nib is a perfectly tuned, elastic, and smooth fine. When you had an Extra in your hands, you will probably miss its large nib, and the nib number 5 or 6 of the Classica looks a bit small for the size of the pen. On the other side, the Classica has a celluloid section, that many (but it is not my case) prefer to the all metal grip of the Extra. With such a responsive nib, which in line with the size of the tips of Montegrappa’s production is more in the range of an European extra-fine, I decided to test my Classics with a large hatched drawing. 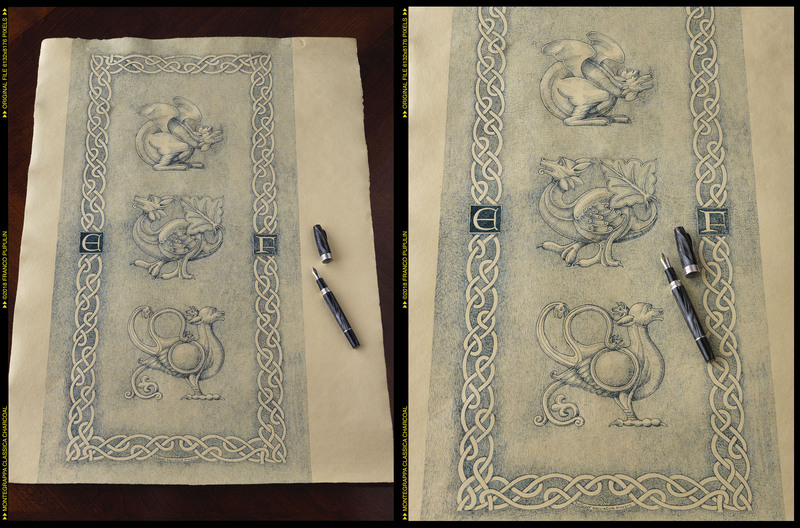 And here it is, my Medieval fantasy, depicting three little dragons, or dracunculi. 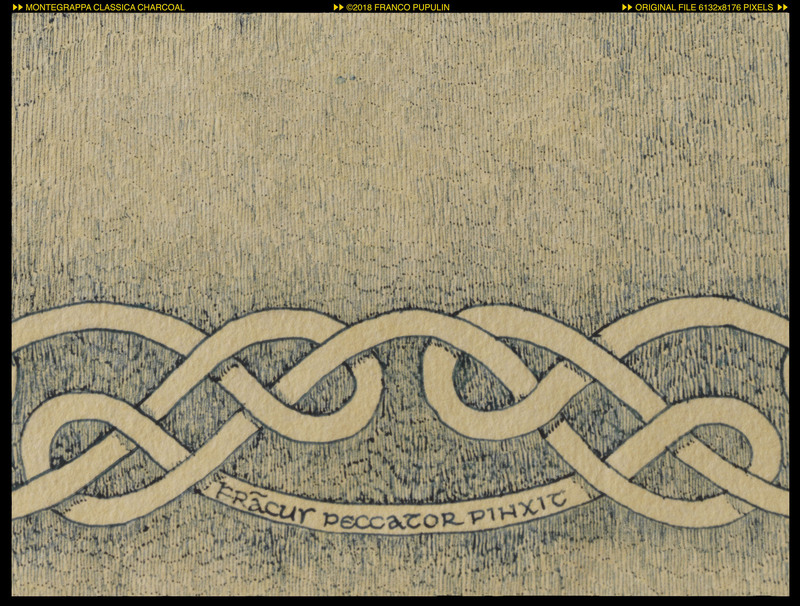 Please note the signature, consistent with the humility of the medieval artist and his sense of sin, due to the vanity of the work: "Francus peccator pinxit", Franco the sinner painted it. 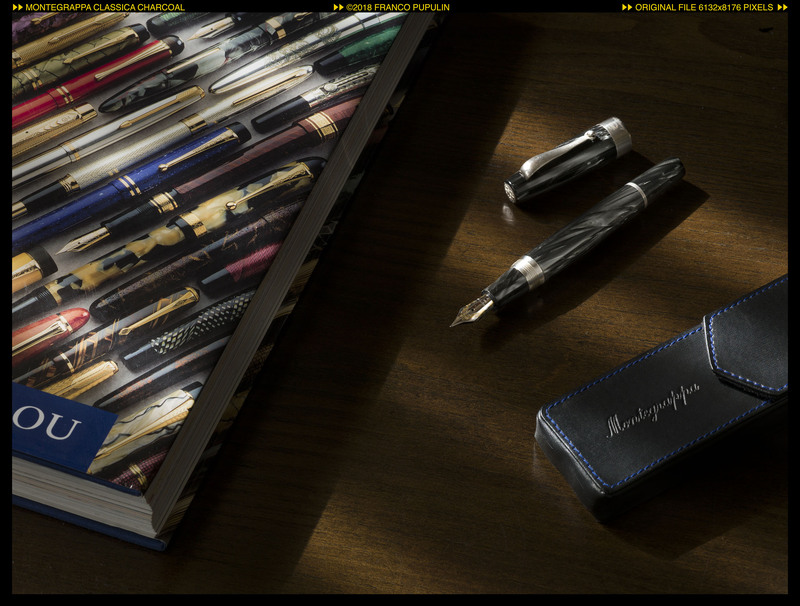 As I said at the beginning, Montegrappa Classica is a progenitor. Classica was born in 1999, and it was an extraordinary invention of the Aquila family. The classic design, with its curved and graceful shapes, the aerodynamic body and the flat ends, is almost perfect and will serve as the basis for a whole dynasty of Montegrappa pens: Historia, Classica in resin, Extra, Extra 1930, Extra Otto (faceted), Miya, Miya Argento, Miya Carbon, the fortunate Fortuna series and finally the slim version of the same curves, the recent Felicitá. 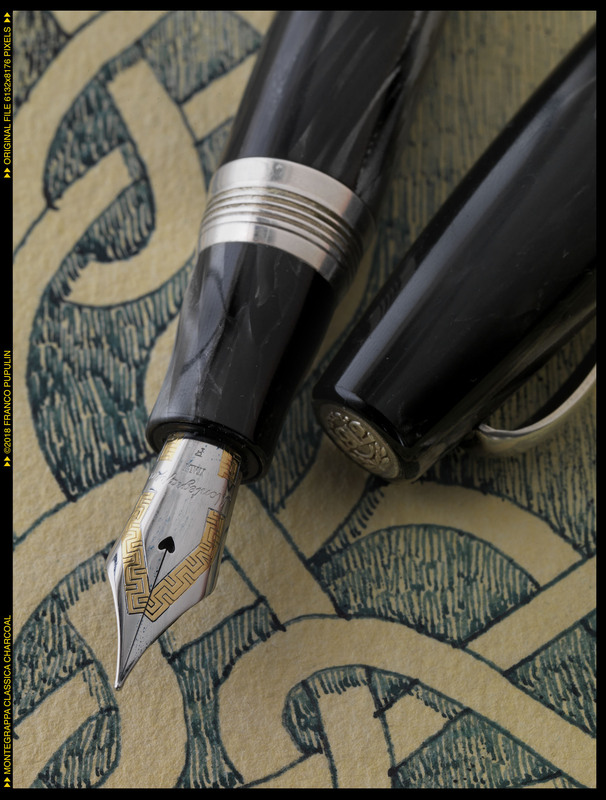 For those interested in retracing the history of the Classica dynasty, refer to the excellent work of jar in Fountainpennetwork dedicated to the regular modern editions of Montegrappa, in turn a classic in the study of the Bassano brand (http://www.fountainpennetwork.com / forum / topic / 223854-modern-montegrappa-regular-edition-pens /) and to his "Modern Montegrappa Pens", accessible on the Internet at: http://montegrappa-h...com/index.html. They are gorgeously illustrated and surely deserve a look by any pen aficionado. Montegrappa has reiterated many times that Classica and Extra resume the design of a pen from the house from the 1930s, but I have searched the images of vintage, modern and ancient Montegrappa pens far and wide and, however extraordinary they are, I have not never found anyone who can be considered the true forerunner, the sure ancestor of the Classica. 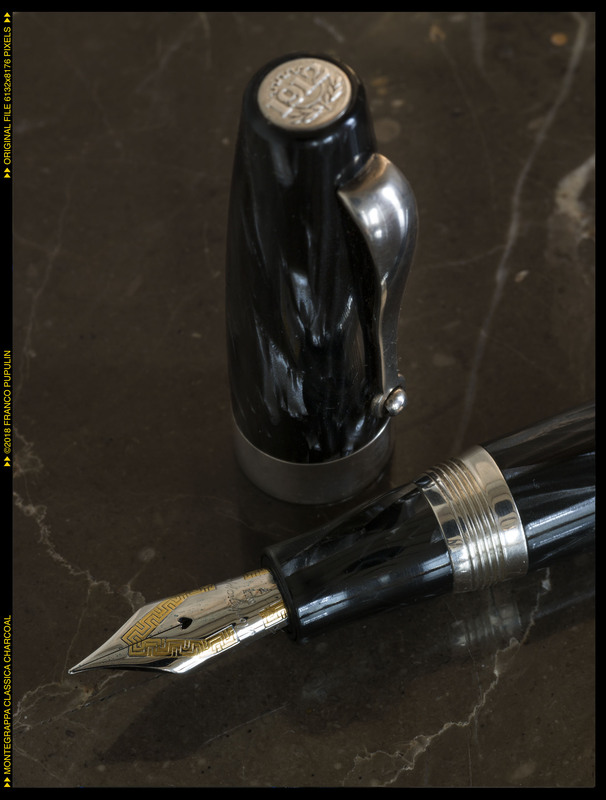 With Classica, Montegrappa inaugurates a vein of design and style in its pens that even today, after twenty years, does not give signs of approaching exhaustion, but continues instead more lively and lively than ever. I said that Classica was born "almost" perfect. The blind cap is visually a bit too long, and this slightly unbalances the proportions between the body and the pen cap, which appears short (and is actually shorter than the Extra and Miya hood). I tried to calculate the proportions between the whole pen and the hood only, to see if the designers of the Classica were inspired by a sort of “proporzione armonica", but as far as the relationship is concerned, the fateful 1.618 (the "divine proportion") which is present in the Emblem), the relationship is not exact. Historia, the limited edition launched that same year 1999, maintains the same dimensions as Classica, but already Extra perfects this point. In fact, the body of the Classica is longer than that of the Extra, but what makes the difference is properly the measurement of the filling cone (false in the Classica), which in the Classica is about 1/4 longer. The dimensions of the main body, the area of ​​the thread and the section seem to me identical, even if the section of the Classica is in celluloid and shaped differently from that, wider and in silver, of the Extra. The main metal ring on the Classic cap is smooth, engraved with the logo and the name of Montegrappa. In the limited edition Historia, Montegrappa introduces on the ring its now very classic Greek motif, which still lasts in various lines of pens. With Extra, the ring retains the Greek, but becomes wider and definitely Montegrappa. The same ring width, but without the Greek design, will also be used in the beautiful resin version of the Classica. I insist, Classica was an extraordinary invention, a coup de génie of the Montegrappa designers under the acute vision of the Aquila family. Classica was also the best gift that the company could leave as a legacy to the new owners of the brand, the international group of luxury, based in Switzerland, Richemont, which acquired Montegrappa in 2000. 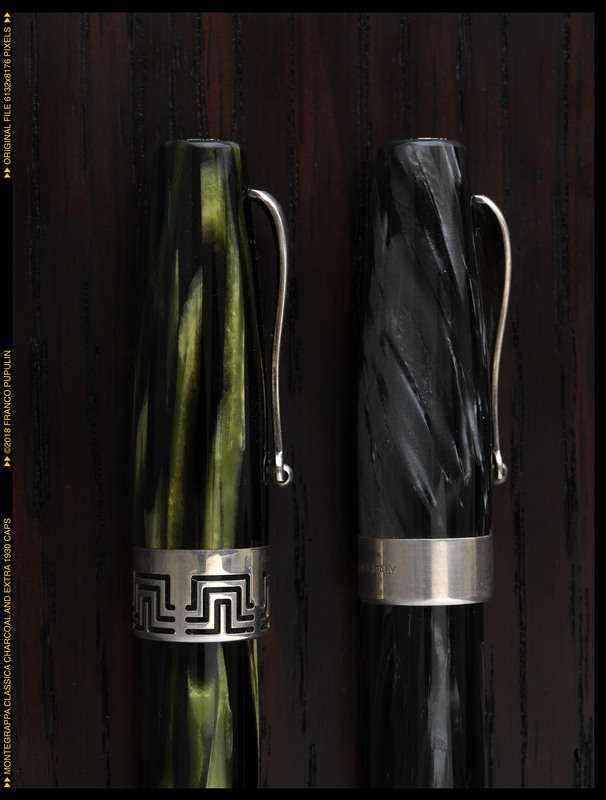 Not only Classica in celluloid continued to be produced, as evidenced by the fact that there are versions in which the silver has the punch of Vicenza (VI, management Aquila) and others with the punch of Milan (MI, management Richemont), but in 2004 the new management also introduced a resin version of the same pen, cheaper but not less beautiful, in blue, red and black. 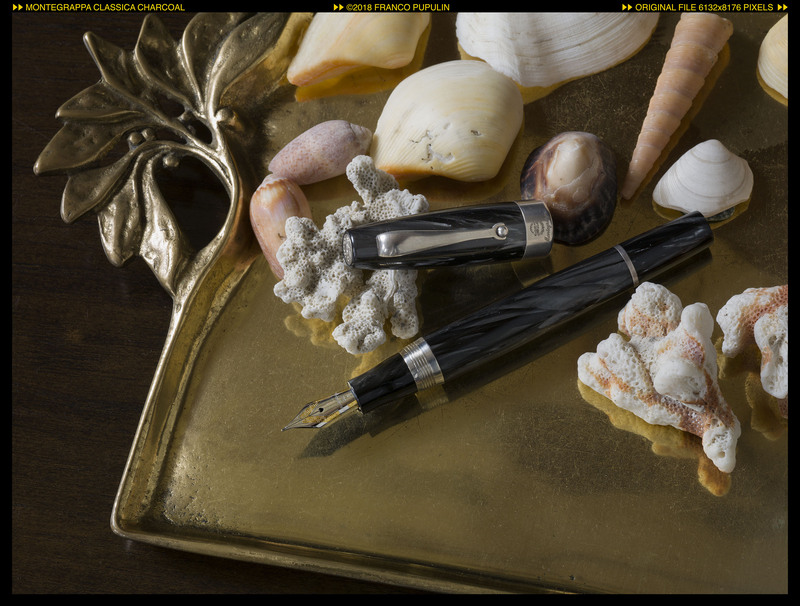 Classica was produced in celluloid of three colors: a classic, sober pearly black, a vibrant cinnamon red, which somehow recalls the hard rubber of the pens of the 20s and 30s of the last century, and a brilliant marine turquoise color, deep and full of transparencies. While the red and turquoise celluloids will be used by Montegrappa, alone or in combination with other materials, for other lines of pens (Symphony, Miya, Miya Silver, Miya Carbon, Emblem, Emotion, Extra APC, as well as various special editions), the red cinnamon has not been used anymore as far as I know, except in Passion and perhaps in the recent Extra Colors of the Sea in coral color, whose celluloid seems to me very similar if not identical to that of the original Classica. Celluloid is also found in the short section of the Classica, below the silver ring that completes the proximal part of the body. This is a detail of great interest to the many pennophiles who do not like metal sections because they find them slippery to their fingers. 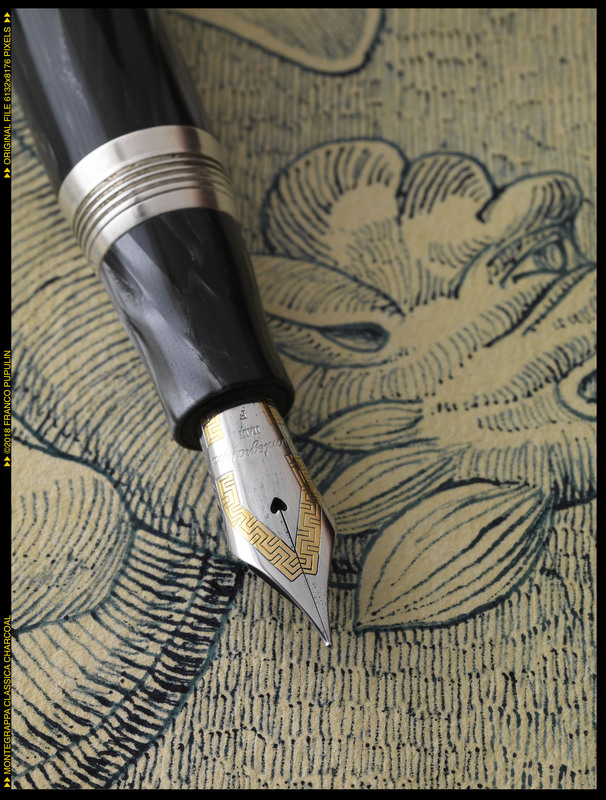 The nib, with the Greek design that Montegrappa's literature defines as "Palladio", is a measure 5. Visually, I find it a bit small for the size of the pen, but this did not prevent Montegrappa from maintaining these proportions in various of their lines of high-end pens, reserving the big nib No. 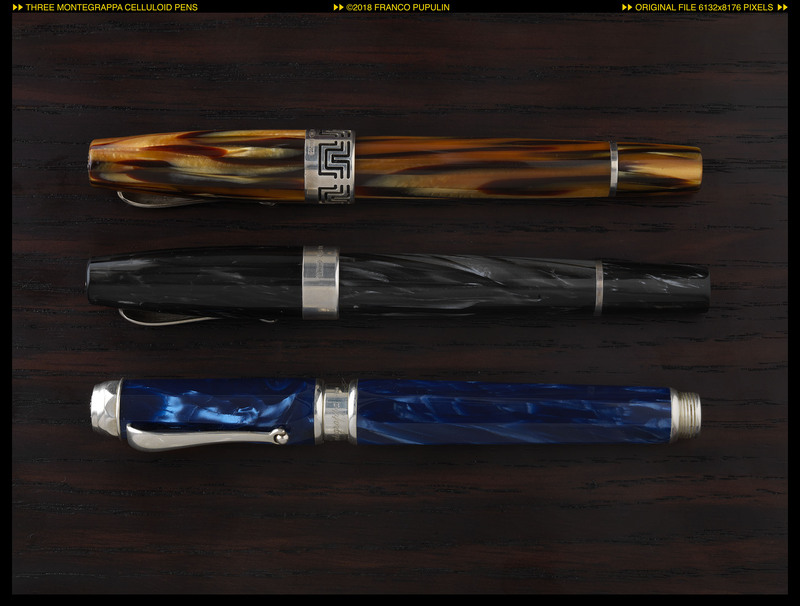 8 only to Extra, Extra 1930 and Extra Otto regarding the pens in celluloid, and to the only Ducale Grande among the pens in resin. 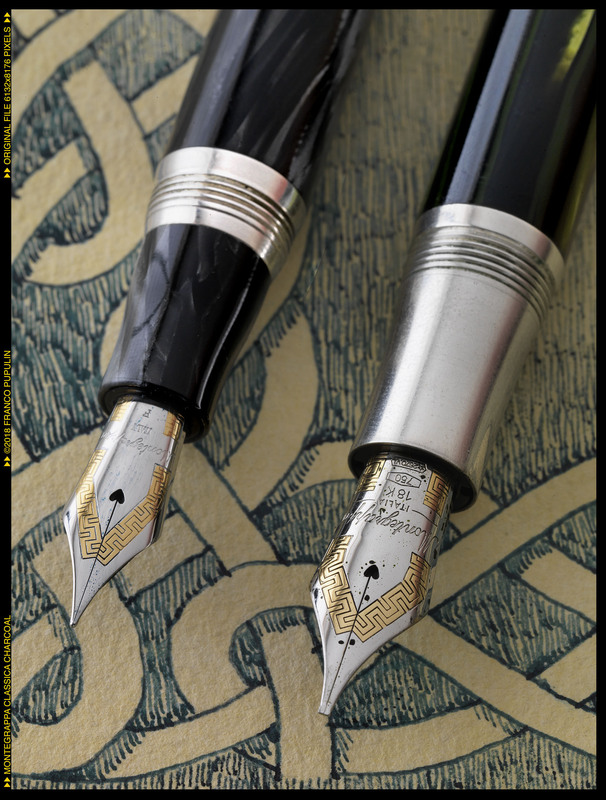 In my Classic, produced during the Richemont period (the silver punch indicates MI, Milan, instead of the VI, Vicenza, of the Aquila pre-2000 management), the nib is pleasantly semi-flexible. Perfect from the first moment, the nib of my Classic is obviously not calligraphic, but has a certain elasticity that gives it calligraphic qualities and I use it sometimes to play with the Copperplate style script. With the exception of the cinnamon red, the celluloids used in the Classica are those already tested in the Symphony line, produced by Montegrappa in carbon black, turquoise, red, parchment, yellow and dark blue. The pearly black, the red and the original parchment color are used, that same year 1999, for the three liveries of the limited edition Historia, each one produced in one thousand pieces. Historia has the same design of Classica, the same measures, the same charging system (with the removable blind cap to reveal the converter), but the section is entirely in solid silver and the cap ring carries - for the first time - the one which will become almost a symbol of Montegrappa, the decoration with the Greek type "Palladio". On the terminal of the back cone, the silver disk bears the limitation number (xxxx / 1000). The top of the hood, however, is devoid of the beautiful disc decorated with an engraving of the laurel and the date 1912. 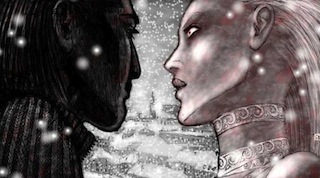 With the same size and design, Historia wins the duel for the beautiful greek that adorns the ring of the hood. Classic, from its own, has the silver disc that closes the top of the hood with one of the symbols of the house, a refined detail and a motif that Montegrappa will adopt from then on on all its high-end pens. The dynasty inaugurated with Classica has had a growing success. 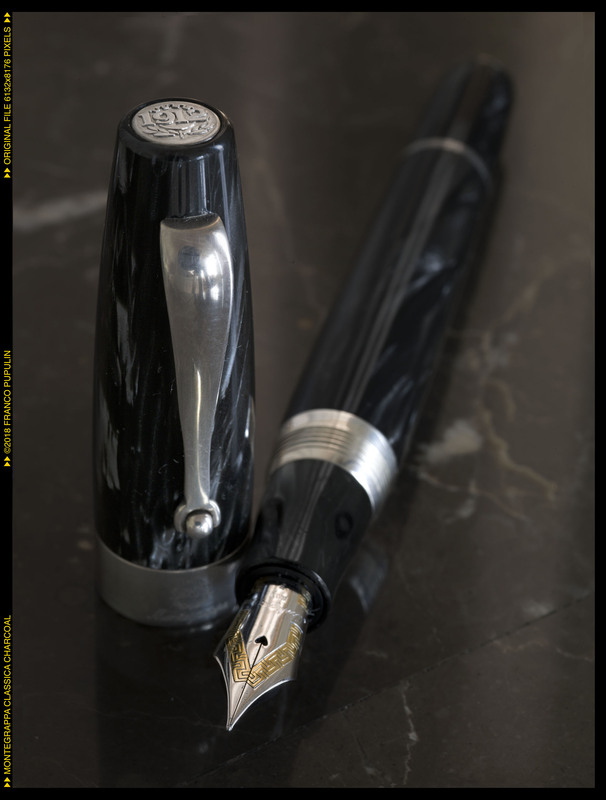 After the limited edition Historia, Montegrappa launched Extra, a pen destined to become almost a symbol of the Bassano's house, reiterated in numerous celluloids before becoming Extra 1930, also produced - to date - in six types of celluloid in the regular edition and in two different celluloids, in antique wood and completely in silver, in further, more limited editions. The “shape” of Classica established the beginning of a lineage that required only some minor changes throughout its twenty-year history. Basically, the cap with a rounded profile and progressively streamlined towards the flat top remained unchanged, as well as the typical, almost cylindrical body, but in reality also curvilinear and tapered in the direction of the terminal, flat cone, and the unusually large, solid silver ring of the cap, together with the terminal tag that bears the logo of the company's founding date. On this "archetypal" design were inserted the successive minor variations which gave rise to Historia - the forefather of the “Palladian" greek fret -; to Extra, with its number 8 nib, the large greek and the silver section; to the sinuous shape of Miya, with its characteristic bulge over the section - then iterated in the silver and carbon version; to the genial Extra Otto, which reinterprets all the motifs of his genealogy in a fairly contemporary version and at the same time recovers an essential part of Montegrappa's DNA in the octagonal design. I leave you, after this long excursus, with a couple of images. The first "summarizes" the dynasty of Classical, presenting an overview of the various models (not all), to suggest the vitality of this lineage in terms of shapes and materials, with its beautiful celluloids, resins, metals and the rarest materials. 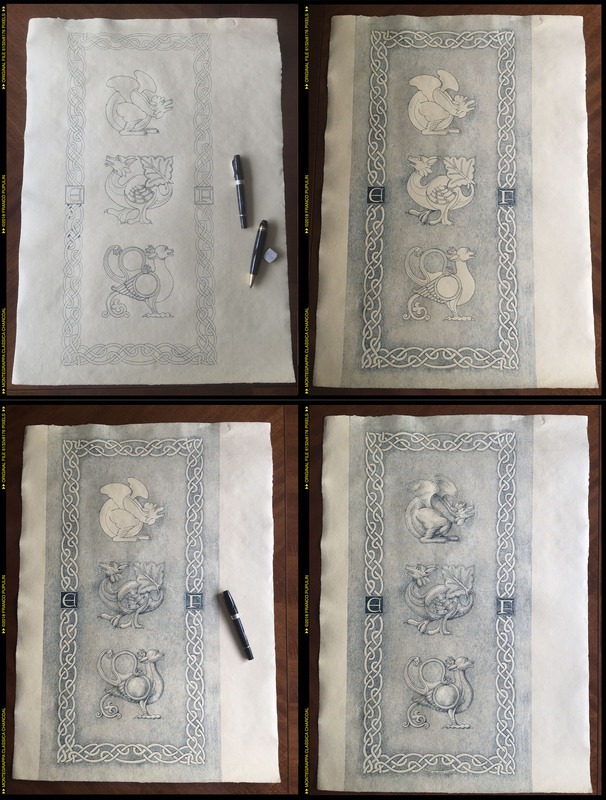 The second image represents a "chronology" of the dynasty inaugurated with Classica and traces its inventions, the creation of lines, the introduction of new materials. From this historical synopsis it is evident that the Classical heritage, far from being exhausted, has experienced a true creative revival in the last three or four years with new models, new materials and new stylistic elements in the most classic tradition of this extraordinary pen. Not included here are the limited editions that derive directly from this dynasty, many, often beautiful, with rare and unique materials, mostly inspired directly to Extra 1930. I hope to cover this chapter later. 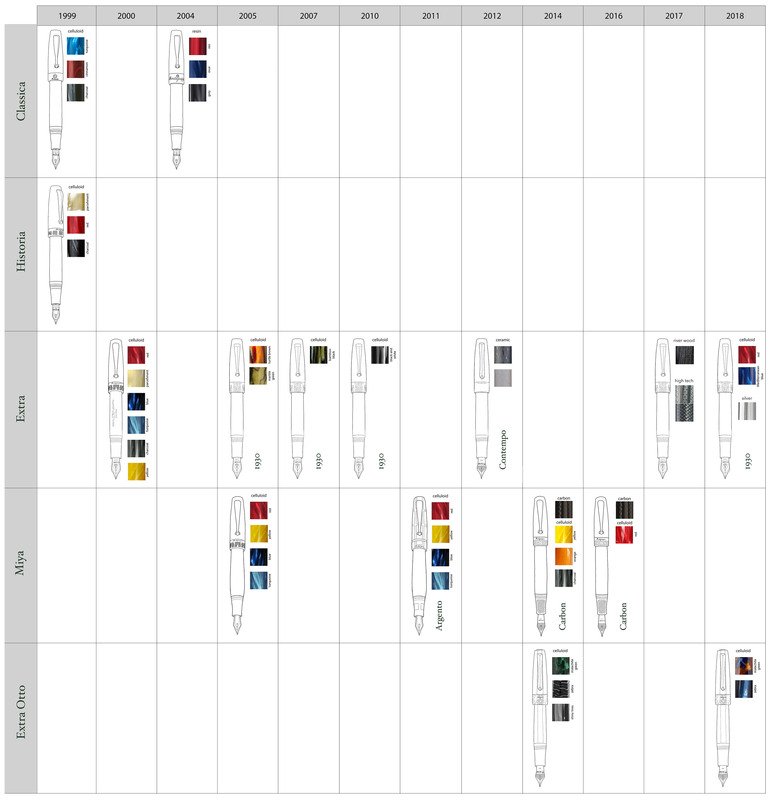 Personally, I have no doubt that Classica and its descendants, and in particular Extra and Extra Otto, represent authentic, timeless classics in the contemporary history of fountain pens. wow what an amazing review! congrats on the drawing too! Finest morning read, before the day starts for real. Thanks! 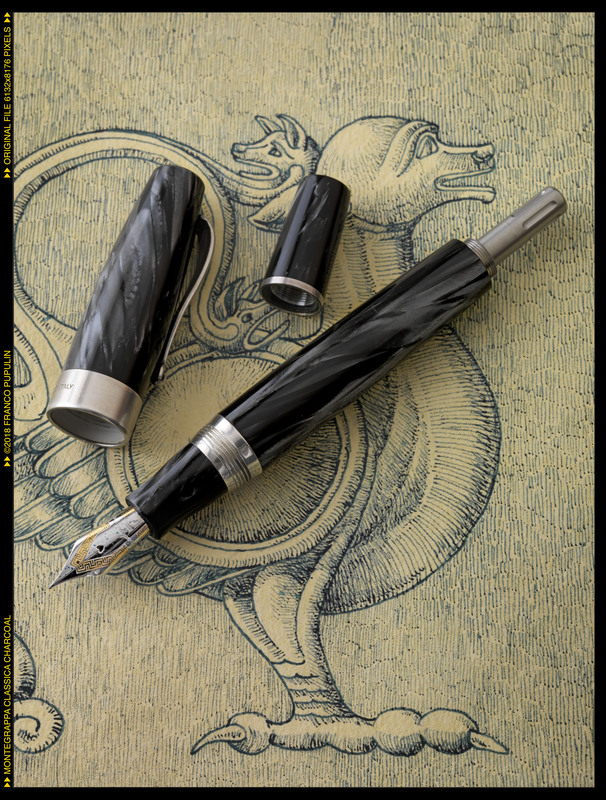 Beautiful writing tool, I do have a thing (or two) for Montegrappa. May be some day. Edited by Namo, 09 November 2018 - 11:44. Love the Classicas; particularly the celluloid ones before Montblanc took over. A great thread, so much love and passion for art and history in the narrative. Love the details about the artist signature on the drawing. And the photos are beyond compare. I forgot or did not know that Richemont owned Montegrappa. One question — where does the Symphony model fit in this story and/or the graphic? 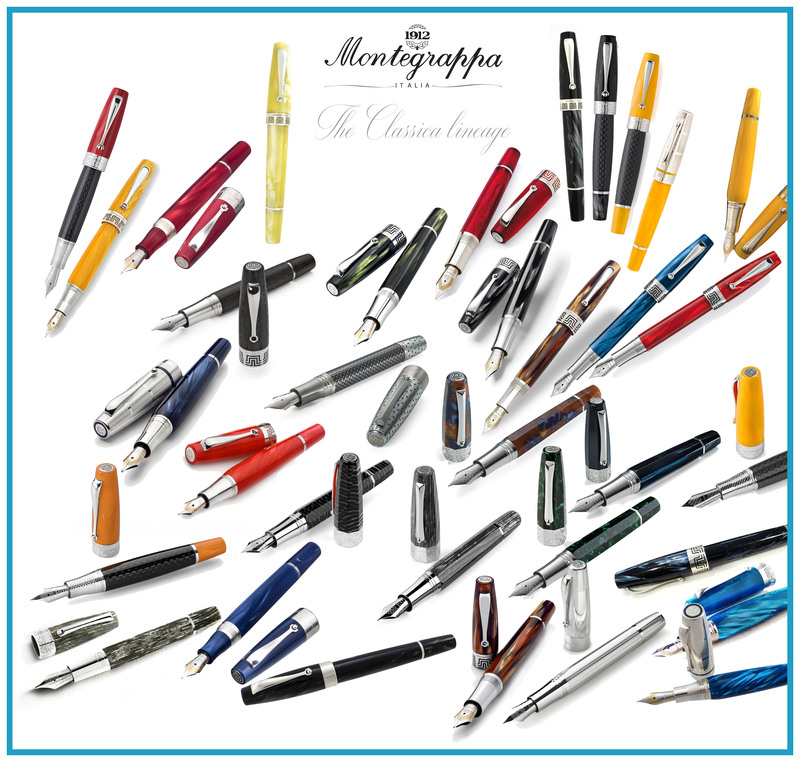 The Symphony is yet another family of pens from Montegrappa and doesn't fit in the Classica series. Thanks, Jar. The Symphony is another beautiful pen in its own right. jar, please explain the difference(s) between the Extra and the Extra 1930. Thanks! And thanks also to Franco for the beautiful photos! The differences are small. They were two separate releases, the Extra the earlier one. The visual difference is that the Extra will have the engraved Monte^^^Grapa on the body. Omas Extra 630, Real Or...? Namiki/pilot Falcon Owners: Soft Extra Fine Vs Soft Fine. What To Buy?